Football Manager 2009 is the latest chapter in one of the most popular PC gaming series ever to hit the shelves. This latest version was released on November 14th and is sure to be a Christmas bestseller. For football fans outside the UK, the game is also known as Worldwide Soccer Manager, and the game is also available on Playstation Portable. This latest version of the football management simulation had promised some improvements and enhancements to previous versions, and I covered the most significant changes in my review of the FM2009 demo. While I felt the demo version was a little rough in places, how does the full retail version stand up to scrutiny? Things did not get off to a good start and the installation of the game was fraught with problems. Firstly, the DVD game key, which is printed on the rear of the manual uses a dot-matrix style font, which made it hard to decipher some characters and it took a couple of attempts for the software to accept my game code. The font makes the letters ‘O’ and ‘I’, and the numbers ‘0’ and ‘1’ appear almost indistinguishable. As if that wasn’t enough, SEGA, the game’s publisher had implemented an online verification system based on the unique DVD key of the game disc. However, it was nigh on impossible to have the game verified online due to network traffic, but also to some erroneous errors in the verification process. On my first attempt at verification I was told by the game’s verification system that my particular game key was in use and the verification would not proceed. Upon trying again, I wasn’t able to connect to the verification server and this was the case for the next hour or so, before I managed to connect only to be told that my game key was in use! I’d have laughed if I wasn’t so annoyed. After a complete uninstall and reboot of my system, I reinstalled the game and this time managed to get the game verified correctly. SEGA have since issued an apology in the wake of the verification fiasco, blaming higher demand than what was expected. Given the game’s popularity in previous incarnations it was a shockingly bad error and SEGA really should have known better. But, with the game now installed and verified it was time to download and apply the first of what will likely be several patches. Once that was done it was time to kick-off the game proper. Football Manager 2009 gives the player the choice of over 5000 clubs from over 50 countries. As before the game can be customized to suit the player’s PC, allowing the player to choose database size, manageable leagues and other choices, including fog-of-war attribute masking. Players of FM2008 will notice that the interface for Football Manager 2009 hasn’t had much of a revamp, other than the implementation of a new skin. The in-game menus are all located in the same place, and contain the same options as before so for those already familiar with the game, things are easy to pick the game up. New players too will find the game easy to follow as the menus and sub-menus follow a logical order, so game options are easy to find. The only stumbling block for new players will be the sheer depth of information available, which some players may find overwhelming. Given time, however, it all fits into place and the experience is both immersive and addictive. FM2009’s big selling point, and the one which has divided fans more than any other has been the implementation of a 3D match engine. The 3D match engine proffers the player with the ability to watch matches played out using full 3D rendering, from a variety of camera angles, rather than the traditional and simplistic 2D, top-down display of previous incarnations. The traditional view has remained for owners of lower-end PCs and/or laptop play, as well as for purists of the game. The 3D engine for FM2009 was developed by SEGA Japan’s ‘Virtua Striker’ game and underwent some thorough testing in Football Manager Live, but it felt disappointingly unfinished in the demo version and it wasn’t long before I found myself back using the 2D, top-down view. In the demo version, the 3D view felt completely randomly generated and only a small selection of player movements ever seemed to be shown. However, the full retail version of the game sees a much more polished 3D match engine than in the demo version, with a greater array of player movement and tactical awareness on show. Player models are detailed enough to note basic features, such as hair colour and skin tone but there’s little resemblance to any player they’re supposed to represent otherwise. However, the game engine is not perfect. On the downside, the loading time for the 3D view can sometimes be quite slow, while during the match players sometimes get ‘stuck’ for no reason, or stop suddenly when chasing through balls, and their choice of passing is sometimes utterly puzzling. There is also a lot of ricochets and bounces from over-hit passes or shots, with direction of the ball somewhat questionable given the laws of physics, and this seems to happen more so than there should be normally be the case in a real-life match. There’s still a tendency for goals to be scored via long range strikes, rather than goal-mouth scrambles, but on the whole the FM2009 match engine far surpasses any other engine of a similar ilk, such as Eidos’ attempt in the Championship Manager series. It isn’t overly demanding on your graphics card either, but while some laptop graphics chipsets may struggle, even a low-range 6 series GeForce card should have little trouble in coping with the demands of the 3D engine. One minor aesthetic gripe surrounds the use – or lack of – of the stands surrounding the pitch which are portrayed by ugly big blocks of solid grey. If SI are looking to recreate the match experience then placing spectators here would be a good move, as the sound of the crowd doesn’t really fit otherwise. The improved 3D view in the retail version means that this feature of the game can actually come in handy, and you can now spot facets of your team’s play or tactics which aren’t working, as well as having greater clarity over weak-spots and positions. It’s a step in the right direction and with some further tweaking could go onto better things for future releases. The Assistant Manager role in Football Manager 2009 has been revamped to offer much greater depth to their role in the game. Previously, the assistant manager really was only a minor side role to the main game, weighing in with some limited advice about the team and potential signings, as well as taking on background tasks, such as training or negotiating new contracts. 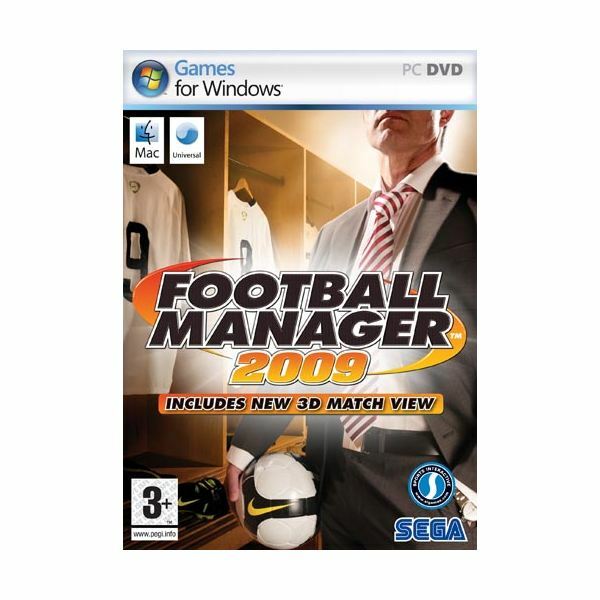 However, in FM2009, the assistant manager can now be able to provide comprehensive feedback about how both you and your opponent are playing, provides feedback on player form, team tactics and more. In a match, the assistant manager can tell you where your tactics are failing but his feedback is annoyingly cryptic as he doesn’t offer a cure for the ills, but merely highlights them. On the flip side, however, he does tell you when players are having trouble adapting to your tactics on the pitch and their physical condition and advises which players should have their match tactics changed to complement the team’s play. Unfortunately, however, for all the advice the assistant manager does provide, it’s a real pain having to switch between multiple screens in order to implement them all. It would be much easier to have a button to implement the assistant manager’s advice quickly. The assistant manager can also provide reports on dressing room morale, potential signings and squad weaknesses and depth. He can also suggest players which may improve problematic areas. Players can now be instructed in training to learn new ‘preferred moves’ which sees players train in aspects of play not normally associated with their style. Players can now be instructed to run with the ball, get into the box or not to dive into tackles among many other things. This helps to enhance the job of moulding your players and team to suit the kind of game you want to play, rather than simply dragging players around the pitch on the tactics board – an omission I found strange at first, but now can see why it was done. Other team related tactics, such as playing offside; zonal marking; using target men and setting team mentalities; passing styles and tackling can also be defined and set using a series of sliders, as in previous versions. The Board and Media interaction in FM2009 have also been remodelled and provides a greater range of information surrounding yours and the club’s performances, so you’ll know which areas you’ll need to sharpen up if you want to stay in a job! Fans feedback – introduced in FM2008 – has also been enhanced, so you can now see what the supporters think of your latest capture and their level of confidence in the player. The introduction of a transfer rumours section has also been made. While on the surface this could be somewhat superfluous, its value cannot be denied and you can be linked with players who you’ve never even considered, but can turn out to be real world-beaters if you take the time to look at them. Conversely, it can also make players unhappy if they find themselves bandied about in the media and linked with other clubs. As manager, you will also be able to attend press conferences, or send your assistant to face the media. Press conferences take place before and after matches and also when players start out at a new club. These conferences involve journalists asking questions at the player, which can be answered with one of five answers. You’ll be asked about tactics for upcoming games, potential signing targets or the latest defeat for your side among other questions, and your answers can have an effect on team and player morale. While this is a good addition and adds to the realism, it does however become very repetitive very quickly. The transfer system has been revamped from previous versions and there is now greater scope when it comes to signing players. Transfer deals can now be bartered more than before, and negations can now see you land a sought-after player at a more amicable fee, whereas before in previous versions, the prices were pretty much set in stone and you’d often have to pay over the odds to sign a player. There is also a greater emphasis on bringing players in on a loan spell first for a smaller fee, with an option to buy. While this feature was implemented in FM2008, it didn’t work all that well and you can now see how much other clubs are willing to pay to bring in a player in this manner. Selling your deadwood players is also easier than before, and you’re now more likely to be able to shift those players you no longer need or want. Offering players to other clubs is easier and more effective, and offers for your players are more likely to be received than before. As in FM2008, you can also adjust your wage budget for players by redirecting some of your transfer budget and vice versa. There are still problems with the game, although many have been ironed out somewhat with the implementation of the patch. The most notable is still the problem with player injuries. In the demo it wasn’t uncommon to have a lot of players out injured and despite the promise of being fixed by the patch, injuries are still happing too frequently for my liking – every other game I am still losing one or two players to injury, whether they are serious injuries or not. At one point I had seven of my first team out injured with a variety of ailments and building a settled team has so far proved difficult. As previously mentioned, some of the players’ decisions in-game are baffling; choosing to play a short pass of the ball to a heavily-marked team-mate rather than play a long ball to a striker in space for instance is just one strange tactical decision, while players tendencies to stop chasing loose balls or collect a loose ball and then stand still with the ball rather than initiating a move can be infuriating to see. Other small niggles include some rendering problems with the 3D match view, such as lines not always being drawn, animated players running but ultimately not moving and slow loading times; all of which, while annoying don’t ultimately detract from the game. Football Manager 2009’s system requirements are relatively modest, but to be able to run the 3D match mode, you’ll need the following minimum PC specification. It is good to see that problems that were evident in the demo version have been addressed and to a large extent cured in the retail version and subsequent patch. While it was always going to be difficult to top the near-perfect representation of football management in the Football Manager 2008 release, the new additions to FM2009 have been well thought out and add a new level of depth to the game. While it is still a little rough in some areas this latest installment of the game makes a good fist of taking the game to the next level and ultimately succeeds in doing so; as new patches are released, this game can only get better. While the 3D match engine may not be to everyone’s taste, the sheer depth of the game make it an essential play for any football fan and there is still only one football manager game worth considering. This is a must-buy title for anyone with an interest in the beautiful game. A collection of reviews for various versions of Football Manager. Football Manager Live is Here – Time to Quit Your Job!